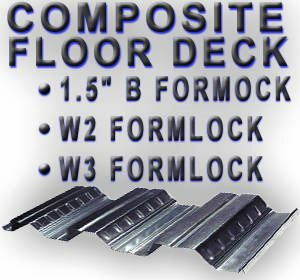 ConDeck is a statewide source for metal deck and metal deck accessories. 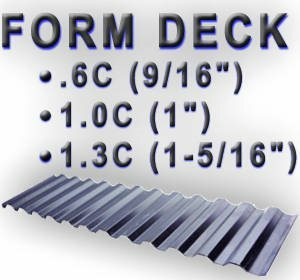 In-stock items include many profiles of painted, galvanized, and acoustical metal deck. We specialize in small orders, cut to length, and delivered if required. ConDeck Corporation offers a complete range of steel decking. Steel roof and floor decks have long been recognized for their economy because of their light weight and high strength-to-weight ratio. They provide a durable and attractive roof or floor system for fast all-weather construction. Steel decks also provide excellent lateral diaphragm action thus reducing the necessity for structural bracing and their incombustible nature assures architects, engineers and owners of excellent fire ratings. ConDeck offers a selection of finishes: prime painted and galvanized. Prime painted - prior to applying a baked-on acrylic medium gray primer, the cold rolled sheet is chemically cleaned and pre-treated. An off-white primer is available at an additional cost. ASTM-A653-94, Structural Steel, and Federal Spec.QQ-S-775, and they are offered in two (2) zinc coated finishes. (1) G-90 - 0.9 ounce/sq.ft. (2) G-60 - 0.6 ounce/sq.ft. 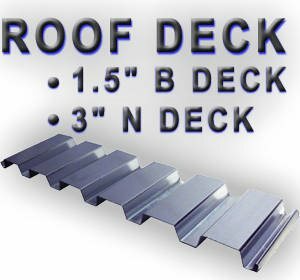 Note: ConDeck Corporation stocks and sells most types of Metal Deck and Metal Deck accessories . Please call for a complete list of Products and Pricing if you do not see what you need here.